I am back in Rome, back in the same lounge room in fact, circling my way from central Italy, to Salerno, to Sorrento, and back to Rome via Napals. It was oddly nice to come back to something familiar. Not that home-sickness has kicked in yet, it only being nine days since I left Australian shores, but the human inclination to nest is still present. Dom, Nikki and I are all excited for London, and the nest we’ll make there. The three of us decided to wake early before the heat of the day would beat us back inside and go for a run along the banks of the Tiber River. It felt good to stretch my legs and accelerate my heart rate — the view of the sun rising above the river, bridges arching overhead every hundred metres helped add to the magic of the moment. I last wrote from the shores of Sorrento, and it was literally ten minutes after writing that entry that a thunderhead rolled over, the wind picked up, and, most gloriously, the temperature dropped by about five degrees. I almost cried. The change only lasted a few hours, and by the next day temperatures were back in the mid-thirties, but the reprieve was appreciated. I’ve spoken to a few locals by now who all state Italy is going through a heat wave — hearing the locals complain about the weather made me feel better about my own complaints. I’m sure people back in Melbourne, huddled around their heaters, would be resentful of my complaints. Yesterday was a travel day, and we trained it firstly to Napals, then immediately boarded anther train back to Rome. We were all very impressed with our newly earned train-savvy. 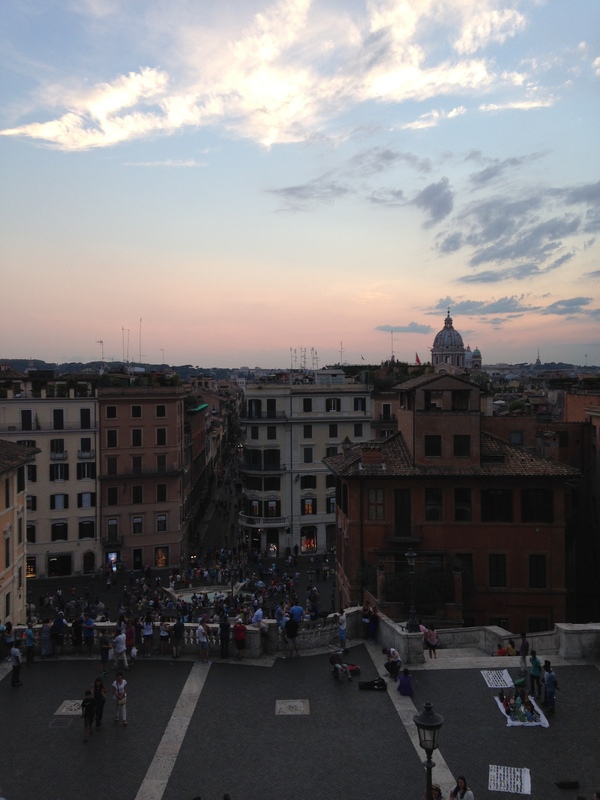 Once back in Rome we ate, rested, then made our way to the Spanish steps. When I asked Dom what the significance of the steps were, he replied, “To get people higher up the city.” He was not wrong. The beauty of the marble steps was detracted by the hoards of roaming salesmen, sweaty people shoving roses into girl’s hands before insisting their boyfriends buy more. Nikki was an expert in growling out a “No!” and sending them scurrying away. Handbags and sunglasses, laser pointers and selfie sticks were all on sale — you know, all the things you want thrust in your face while trying to enjoy an ancient architectural achievement. Eventually I lost my patience, and when a man showed off his laser pointer, creating a small dot of light a few metres away in an effort to impress me, I asked, “Why would I want that?” He didn’t have an answer for me. The view from the top of Rome sprawling away, the dome of the Basilica in the distance, made battling through the plague of sprukers worth it. Today we reboard the trains and make our way north to Umbria, where we’ll meet my cousin, and Dom’s sister, Vanessa, her partner, Steve, and their son, Jonty, as well as some of Steve’s family and friends, to spend a week together. This insanely generous couple invited us to join their holiday, and their generosity continues as it’s Steve’s apartment that the three of us will be staying at in London. I can’t thank them enough. Did I mention that the place in Umbria is a villa. In Italy. An Italian villa. Yeah. The train had just started rolling by this point, and despite our tugging at the handles, waving at the train driver, and a family on the other side of the doors attempting to force the door for us, it continued to glide on, leaving us stranded on the empty platform. We wandered around, learning that the next train wouldn’t arrive for an hour, while we were scheduled to meet Steve in half-an-hour’s time at the next station down the line. The old Englishman who had told us we were at the wrong stop, who we learned was called Brian, informed us that Spoleto was five kilometres down the road, a decent challenge in the stinking heat and lugging around fifteen kilogram bags. We had a wander through the tiny township of Baiano di Spoleto, resigned to wait an hour but hoping to find wifi to at least alert Steve that we would be late. Dom ran into Brian at the only open cafe who, upon learning we were having no luck, told him that his wife would be by soon and could drive us to the Spoleto train station. After profusely thanking Brian, we sat at the cafe’s outside tables and waited, discovering that Brian was an ex-Dean of a law university in England, and spent half his retired-life in Italy and half in Britain. Brian’s wife, whose name we failed to catch and will hereafter be referred to as Wife of Brian, was equally lovely and appeared completely unfazed when her husband informed her she’d be chauffeuring three strangers down the road to Spoleto. Due to our oversized bags, Brain continued to wait at the cafe, and within minutes we were waving our new friend goodbye and on the way to the Spoleto train station with Wife of Brian. The trip was closer to ten or fifteen kilometres than the five Brian estimated, and we were relieved we hadn’t risked the walk. Steve probably wouldn’t have found us if we’d passed out on the side of the thin road, oversized backpacks still on our backs. After farewelling Wife of Brian, thanking her and being rebuffed after offering her money, she wished us well and drove out of our lives. The family that had tried to open the train doors for us from the inside were at the station and approached — they were Steve’s brother’s family. They had recognised us from Steve’s description, and had known as we both tugged on the door, the train moving away, that we’d gotten off at the wrong stop. We sat and chatted for an hour, watching a storm roll in within minutes, the wind blowing the torrential sheets of rain sideways, and lightening streaking through the black clouds. Steve’s brother, his wife and young daughter and son were all incredibly friendly, and comfortable conversation was achieved instantly. A short wait, a drive out-of-town and up into the hills, and we had made it, despite the self-inflicted hiccups and due in large part to the kindness of Brian and Wife of Brian, to the villa. And, more importantly, to Vanessa, Steve, and their beautiful boy, Jonty. I am sitting in the dining/lounge/kitchen space of the villa — the upstairs one, there’s another downstairs. The house is quiet, the ten other inhabitants still sleeping. It has been nice to stop. The villa is about a twenty-minute drive out-of-town and up into the hills, and the only way in and out is via the car Steve hired. The car seats five and as there are eleven of us. It means, in a sense, we’re trapped here. I know this sounds like a plot for a horror film (and yes, we’ve taken guesses at who the murderer could be — my bet’s on Jonty), but it is, in fact, perfect. There’s always that onus while travelling to keep moving, keep seeing, keep experiencing, because you probably won’t be back and you have to get your money’s worth. It’s hard to shake because there’s a certain amount of truth to it, which is why enforced idleness in an Italian villa is perfect. With nowhere else to be, I’m forced to stop and just enjoy where I am. To sit and while away hours talking with my companions. To read, to write, to swim, to rest. It’s sickening, I know. And where I am is beautiful. Yesterday Dom and I went for a run through the hills, trotting down narrow tree-lined paths and emerging on one curving edge of a hill over-looking a collection of old buildings (and when I say old, I mean older than any other building in all of Australia), and a ruin of what appeared to be an ancient wall, high and thick, that must have once ringed the tiny township. 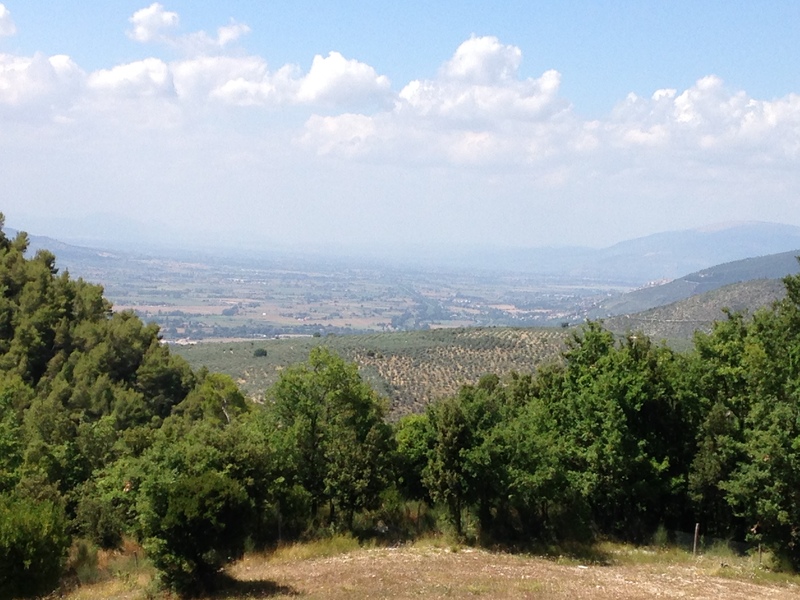 The valley of the Umbria countryside spread out to the horizon, a patchwork of fields and olive groves. While running though the forested hills, it was easy to forget that I was in another country and not simply going for a jog in the Australian bush. What brought it home to me the most was the smells. The fresh odour of the tree sap, the spice of the pollen, told my senses that this was not home, that this decidedly foreign. The only detraction to the run was the horse flies that rose in their hundreds, eager to greet us. Running through the copse, I felt like a car with insects perpetually slapping my windscreen, only in this simile the windscreen is my face. In the end, Dom and I ran with hands constantly moving, battling our way through the cloud of bugs. It was a small price to pay. Today Nikki, Dom and I intend to retrace our steps and see if we can find our way down to the ruin of the wall. I’ll report back on the success of the mission. I can hear movement downstairs and the querying question from Jonty of “Ball?”, so I think I’ll go say good morning. DISCLAIMER: I’ve been alerted by a friend that I’ve never actually stipulated who my travelling companions, Dom and Nikki, are in relation to me, and that this is causing some confusion. Dom is my cousin (on my Dad’s side, for those playing at home) and Nikki is his girlfriend, and my friend. They have their own blog, which details their incredible journey before meeting up with me, as well as parallel tales of our recent travels, if that’s your sort of thing. It a great read, and can be found here. Love hearing about your travels and so nice to hear of the kindness of strangers. 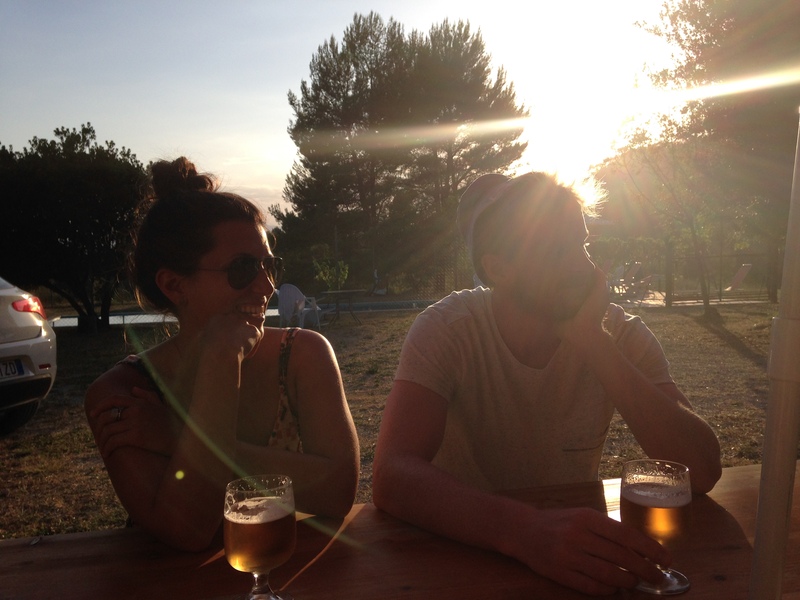 Give our love to Dom, Nikki, Vanessa and Steve – and a huge hug to Jonty. I hear he’s walking now!